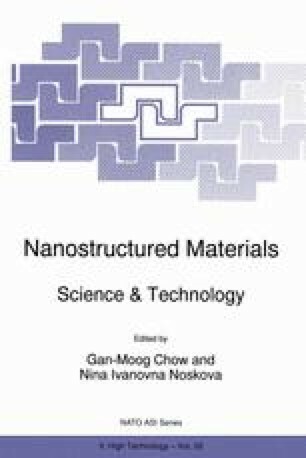 The best known methods used for production of nanocrystalline states [1, 2] include fabrication and compaction of powders, refinement of the grain structure by a strong plastic deformation, deposition of the elements from a gaseous or liquid phase, and crystallisation of amorphous alloys. This paper analyses the changes in some physical and mechanical characteristics of submicrocrystalline alloys produced mainly by other nontraditional methods, such as irradiation and phase transformations. Specifically, a high-dose irradiation of alloys with high-energy particles at 773–973 K  causes formation of dislocation loops and their rearrangement to dislocation subboundaries and boundaries of nanocrystals. The structure may also be strongly refined as a result of the “multiplication” of the γ-orientations in metastable austenitic alloys during direct and reverse martensitic γ→α→γ transformations, which lead to appearance of 242 = 576 orientations of the γ-phase in each initial austenitic grain [4, 5]. The deformation method was also used for production of the nanocrystalline structure. However, this paper focuses mainly on the anomalous phase transformations, which take place during severe cold deformation and which alter the alloy properties.